David: I made my first book today. Cutting, gluing, stitching, pressing and as part of this, I cut mull for the first time, learning how the word from this came from Hindi and is totally independent of all the other mulls. It made me think about directions in terms of language, the different mulls coming down to me from north, east and west – for island, fabric, and cider. According to Mrs. S. an Australian, down south, mull is a word meaning to make a cannabis joint. Meaning from all cardinal points. I was mulling over mull and just felt that this word had to be today’s word, not least as it now has this meaning, only to me of course in my own private language of a coming together from different directions. Jo: I have always loved Twitter, I think used correctly it is a great communication tool. I used it in earnest for the first time in 2012 on a project called Urban Fringe in north Kent. Somehow, I love how these things happen, David became a follower and a fan of the 70 maps that I daily tweeted. I hadn’t tweeted much since then, but one day in response to something I tweeted David kindly responded by saying “my words are at your disposal”. I love it when this serendipity moment happens, or as Steven Pressfield in ‘The War of Art’ would say, when the Muse takes you. His word ‘Words’ jumped out at me. 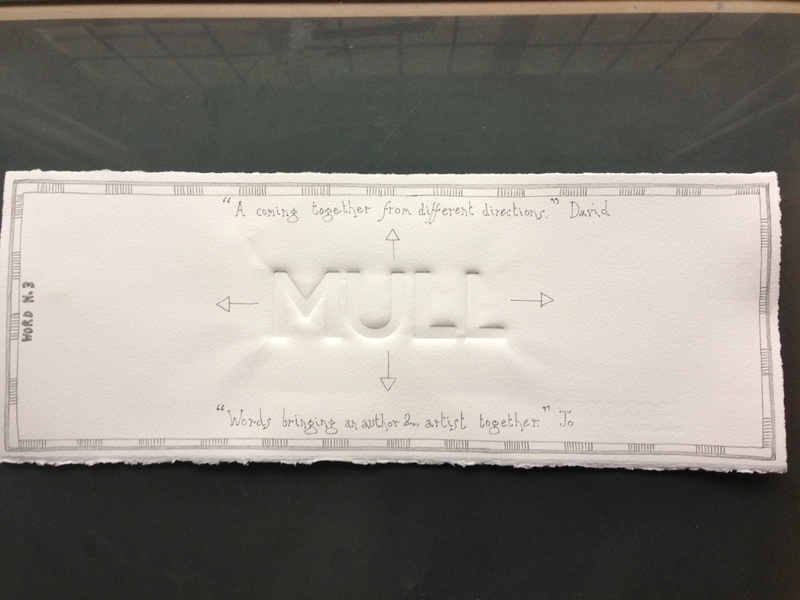 I had decided to do a series of embossed words for Open Studio, but was struggling with the raison d’etre. Here it was!